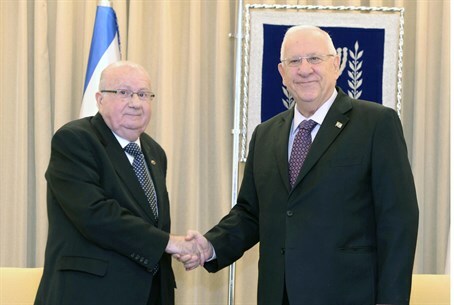 Rivlin made history by meeting Armenian leaders on 100 anniversary, but falls short of recognizing Armenian genocide. President Reuven Rivlin met Armenian community leaders Sunday on the centenary of the massacre of 1.5 million Armenians, the first time an Israeli head of state has marked the killings, reports AFP. Israel has not recognize the slaughter of Armenians at the hands of the Ottoman Turks between 1915 and 1917 as "genocide," with bumpy relations with Turkey likely a factor. "For the first time, an Israeli president has marked the mass massacre of the Armenian people with the Armenian community of Israel," the presidency said in a statement. Armenia's honorary consul in Israel, Tsolag Momjian, welcomed the participation of Israeli officials in ceremonies marking the massacre, after two lawmakers traveled to Yerevan to take part in commemorations. But the representative of the Armenian Patriarch in Israel, Aris Shirvanian, denounced Israel for not having yet referred to the mass murder of Armenians as "genocide." Israeli lawmakers have in the past debated recognizing the Ottoman era massacre of Armenians as "genocide," but only at a time when the Jewish state's relations with Turkey were strained. The Armenians say up to 1.5 million people were murdered during World War I as the Ottoman empire was falling apart. Turkey has denied the allegations of genocide as well as the number of those killed. Hundreds of thousands of Armenians commemorated the massacres on Friday as April 24 is accepted as the date in 1915 when Ottoman Turkish mass murders of Armenians began. In attendance at commemorations in Yerevan were Russian President Vladimir Putin and French counterpart Francois Hollande, who called on Turkey to recognize the genocide. More than 20 nations, including France and Russia, have recognized the Armenian genocide. US President Barack Obama, however, has chosen not to recognize the genocide, despite an election promise he made during his 2008 presidential campaign.